Mama Says delivers public health and educational messages to local people in their own language, attract with films, and every 5 minutes info-commercials. Mama Says delivers public health and educational messages to local people in their own language, we attract with films, and every 5 minutes show info-commercials in local language. We are not giving them free books, we are telling them where to find them, and how to read them on their phones. Knowledge is the real power the people of the last mile need. "9 out of 10 American children do not know about free books, and how to read them on their phones." Why? I think I am scared; I invented a solar powered computer device we call “Mama Says” to communicate with people in Africa, (anywhere) who have no electricity, and earn less than 5 dollars per day. Then to make learning more difficult, they speak one of the 2000-3000 languages in Africa, about a new language every 100 miles, even the best ideas get lost in translation. Mama Says is simple, it is solar powered computer with 17 inch computer screen, that plays fun videos to attract the children. Then every 5-8 minutes there are small information clips in their local language. In Togo, West Africa where I first tested it, the local language is Ewe. We played the film "Lion King" in French, and the information commercial was in Ewe. 100 percent success on testing one, we now need to test 5-10. These small videos clips can educate them, they repeat about 80 times in one day. Plus, the children love watching films, rare for people with no electricity, this alone is a gift of love. 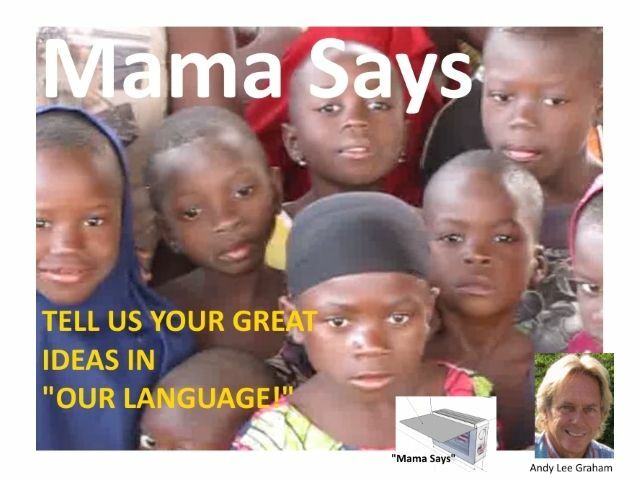 I need to make 5-10 of the Mama Says boxes to test, to prove that Mama Says is a again a great idea, before I ask the world for millions to for free libraries to any village, and person on the planet. Children learn to read in Africa, but they need the books to make it fun, and taught how to read them on their cell phones. My dream is use “Mama Say’s” to explain there are 1000’s of books they can read for free in English, French, Portuguese, German, and 100’s more. This seems strange, but the higher educated people in Africa read what is called the Lingua Franca, the language of business. So for a small child to rise up, learn, have an education, they must first learn a Foreign Language, way above what an American child does, but most learn two languages, but they need fun books to make reading a joy. There are dozens of free places we can download books for free, one example is the Gutenberg.org project, we can download books, put them onto DVD’s or USB thumb drives, then make distribution points. i.e. DVD sales shops, Internet cafe, and sadly, not in libraries because too difficult to find. Last year I made a rough “Mama Says,” a prototype welded out of steel, and tested it in Gbalave, Togo a year ago, it cost 700 USD. Now, I need to make 5-10 more, and test them again in one village in Togo, West Africa to do a "proof of concept" that it works on a broad scale. That there really is a way to educated the world, that it simple, easy, and almost free, we just need to explain in their locals language how to read books on their cell phones, make learning fun. We need to mass produce these boxes out of fiberglass, buy 17 inch computer screens, insert batteries and buy solar panels, we believe made in mass each one can cost as little as 500 USD, hopefully less. I am Andy Lee Graham of HoboTraveler.com, a 60 year old man, who has traveled non-stop for 18 plus years, and visited 107 countries. I have been to Africa over 10 times, and will return soon. I want to make 5-10 Mama Says, prototypes, and test for proof of concept. You ever have a great idea, then was afraid you would never get to use the idea? I am tired of doing this alone, I need support, I need money, I have already spent about 2000 dollars of own my money. We can do this, we can tell the last mile, the ignored, nice people who are ignored because there is no way to make money off of them. I want to explain to them how to find free books, and how to install them onto their cell phones, and smart phones. And yes, it I know, my mother, my brothers and sisters found it strange that people in Togo have smartphones, when they have almost no money. However, they do, as best I can tell, the first thing that Mama Says in any family, is call home, we love you, we will buy you a cell phone. I need 15,000 US Dollars to make 5-10 prototypes, and test again in Togo, with a future anticipated mass produces price of 500 USD as sold to aid organizations. +1-260-624-4414 This number rings at my computer anywhere globally. Please help me find money, so I can prove I can give books to children. I will make 100's of videos of this, does the charity you donate video make 100's of videos proving they actually do something? Most people who ask you for money brag about how much money they raised, I am not doing this, I am telling you what I am going to do, and will prove it. Example of first test in Gbalave, Togo near Kpalime, Togo West Africa. A really true way of actually helping people. They do not need food or toys for their children. They need to learn simple ways to stay healthy and to read to their children and and the parents will do better if they have access to this type of learning process too. John wrote me, I made answers and pasted here. I follow along with your travels. Love your idea of getting reading material to the kids. The box is a good idea and sort of reminds me of early TV. Very effective at reaching kids I am interested in supporting your project. A few quick thoughts and questions. 1. Does this mean with cell phones they have internet? NO, maybe yes, Africa, most countries are about the same, they can buy Internet access on their phones. But generally, the masses do not buy, they jump on WIFI signals in Internet cafes, at least in Togo, then the richer, maybe 2 percent have it on their phones. 2. Does the box act as an internet download device? We will only tell them how to read books for free, or where to go to have a person help them, i.e. an Internet Cafe. "Do you know you can read books on phone?" "Here is how to download and read book?" "If you want free books go to this site, Gutenberg.org Project." "Buy 50,000 at the DVD sales place." We can give 50,000 books on DVD or USB chip to the owners of Internet Cafe's. 3. What do you think of making Mama Says box a local internet hub with local storage of downloaded material and a "TV" that "plays" movies, classes, and books? We would walk into Internet Cafe's and give them a DVD with 50,000 free books, classes, etc, we would hope they would then sell them. But anyone can go to sites we will tell them about to download for free. Please note, there are a lot of languages, so I am trying to keep this simple. 4. Android implies to me that you are thinking of using a cell phone as a basis of your Mamma Says. There are open computer systems like Arduino that are cheaper and easier to program than Android chips. Plus there are commercially built boxes that hold a complete PC system including image generation cards to drive monitors/displays. Android is only our operating system for the Mama Says box, the locals can download books onto any phone, Androi, Iphone, we are not giving them any hardware, we are just telling them how to use their already existing hardware, phones, computers to download book. Generally, the people in the USA are seldom aware they can get books for free, they think they must buy from Amazon, because Amazon advertises, while Gutenberg.org has no way to monetize. 5. Your a production studio for commercials could be distributed and done on line. I have a few connections for this kind of work. Yes, we can use services like Upwork, formerly Elance. Yet we would let local AID organizations do this, as they are stakeholders in trying to reach this group, we can use the Mama Says for 1000's of uses, we just talk about books for ease of understanding, motivation. We need writers to keep rewriting the above, to make simpler, and easier to understand. 6. Fiberglass boxes worry me a little. I think you need a sealed case that can withstand rain and dust. It is far cheaper to buy commercial than try and construct your own. We went down that road and have several vendors we buy from for my day job. This is a work in progress, and the only way to get ideas is to put one on the table. It needs to be light, and easy to put on a plane, my metal one was impossible, I tried to bring home to the USA and ended up leaving in a Hotel. This box would be sold to Aid Organizations, unless our organization got super large, this is a commuication tool, mainly because I recognized that aid organizations have severe problems communicating with locals. They more or less think that the locals know to come to their office. Sadly, aid organizations do not brag about all the techniques they have to reach this 1.5 billion, they instead brag about how much money they raise, the metric of success is raised money, not diffusion of knowledge. 7. I think you need to start the engineering of this project with a couple people to flesh out your ideas and get a top level requirements and design on "paper". This will lead to looking at options in design and material. 8. I think you need to lead the team for commercials and perhaps solicit from your followers ideas for self help commercials. AID organizations already have 1000's of good ideas that are not implemented. 9. Material purchase is a separate job and is not easy given you are meeting box requirements. Issues like how long parts will be around, quantity discounts, configuration control and identifying replacement parts for obsolescence. I have been in business for 30 years, this is the painful part, not the difficult part for me, just a lot of labor, and where I need help. The first ones will cost about 1500, and after that, they will drop radically as we innovate, change, and adapt, I am alread giving to India for prices. 10. Having a price goal rather than "as cheap as possible" makes the system design and engineering easier. Lastly, a little discussion about donations versus selling to the world access to a new population. What if you made a non-profit company that accepts donations but also generated revenue? You could then sustain and grow the capabilities of Mama Says and modify for new markets. I know these people have almost no money but they have cell phones. That alone is a pretty good market. There must be some other things they buy like bikes, cloth, sugar, and saws. They also must have some things to sell. John, this device is perfect for advertising, we could finance the whole project just by selling 1-4 ads on the boxes, but to get it to a level where it is self-financing is why I need help with money. I really do not want to be in the Mama Says advertising business, I just want to get this project on the right path, then give it to a larger organzation. Or, as you can see, I am very transparent, appropriate technology is stolen, so I am allowing the whole world to see this is my gift.